Understanding the structure of a written pattern is the first step to mastering the skill of reading patterns. Each element has an important role and purpose. I like to think of these elements as guides because they steer us down the path of a finished project. Often times we are tempted to skim through the guides and this causes us to miss out on important information. Have you ever attempted a pattern and the project came out two sizes too big? Chances are, you skimmed over an important guide. Sometimes our excitement gets the best of us. I get that. But I’m here to express the importance of reading the pattern from beginning to end, just as you are doing with this post. So what are these guides I keep referring to? I know you’ve seen and heard of them before. They are present in every pattern, professionally or independently published. This is good news for you! There are six guides present in every single pattern you come across. Once you become familiar with them and their specific purpose, you will begin to navigate a pattern with ease. 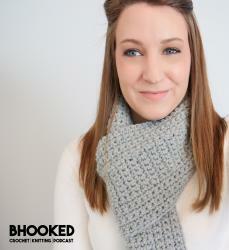 This is the first step in our Master Crochet Patterns series on B.hooked Crochet. I know you’re thinking, “c’mon, Brittany, I think I can figure this one out on my own.” You’re absolutely right! But there is a little golden nugget hidden in plain site at this guide. What is the first thing you do when you have a question or don’t understand something? You ask someone! Knowing who the designer is or brand that published the pattern gives you a point of reference when you get stuck. It gives you the opportunity of sending an email or commenting on their social pages to get help. As a designer, I look forward to people’s questions. It tells me exactly what I need to explain better and it gives me the opportunity to help someone work through a problem. I know many other designers welcome questions so don’t hesitate to ask! Don’t be fooled by this guide. Beginner, easy, intermediate and experienced describe the difficulty level of the pattern, not the knowledge or skill required to complete it. The pattern difficulty can usually be found near the top of the pattern, often times just below the pattern name. Sometimes you’ll see the words typed out “Difficulty: Easy”. Other times you’ll see a little symbol with four bars. If the first bar is filled in, this will indicate that the pattern is beginner level. The pattern will consist of basic stitches with minimal shaping. Such beginner level patterns are often easier to read and are a great starting point on your journey to understanding crochet patterns. I always recommend that, no matter how long you’ve been crocheting, if you want to start learning to read a pattern you need to start with a beginner level pattern. This doesn’t mean that you’re not capable of crocheting something more advanced but you are setting yourself up for success on your main goal: learning how to read crochet patterns. Always start off with a beginner level pattern. This is so important to your success. If the first two bars are filled in, the pattern is easy difficulty. This type of pattern will still use basic stitches but it will often incorporate repetitive stitch repeats, simple color changes and basic shaping. Only after you’ve mastered the beginner level pattern should you move on to the easy level. By doing so, you are allowing yourself to work up to more complicated instructions. Again, it’s not that you don’t know how to work basic shaping on your own but you’re still learning how these instructions are written. When three bars are filled in, you are looking at an intermediate level pattern. As you can imagine, the intermediate level pattern will add a few more elements. You’ll see a variety of techniques here including some basic lace patterns, more complex color patterns and moderate level shaping. Since the intermediate level pattern can have a variety of techniques within it, I always recommend staying at this stage for several patterns. I worked with intermediate level patterns for an entire year before trying my hand at an advanced level! This doesn’t mean you’ll be stuck in the intermediate stage for a year but be sure you’ve worked at least six intermediate patterns without difficulty before attempting to move on. When we’re in the learning stages, it’s very important to set ourselves up for success so we don’t get frustrated and throw in the towel. Finally, when all four bars are filled in, this indicates that the pattern is at the experienced level. You’ll find projects with intricate stitch patterns, techniques and dimensions and/or complex color variations. Advanced patterns also utilize threads, smaller hooks and refined finishing techniques. The sky’s the limit here, really. Pattern difficulty doesn’t get any more advanced than this so you’re bound to find anything. For many of us, this is our end goal, to be able to read an advanced level pattern. It’s a great thing to strive for but you have plenty of time to get there. Take your time. Work through at least six patterns with ease before moving on to the next difficulty level. Of all the guides, this one is the most straightforward. No hidden golden nuggets here. Just raw information. Every good pattern should have listed each type of yarn used. Brand, color and yardage are absolute must haves. Very thorough patterns will even give you the unit conversions for yardage and meters! In addition to the yarn information, a good pattern must have a recommended hook size. I say “recommended” and not “required” for a very important reason. We’ll get into this reasoning in guide # 4 when we address the dreaded yet very important topic of gauge. You may also find optional materials in your pattern. Items such as buttons, scissors, needles, felt and any other supply used to recreate the design. The short answer to this question is no, however there is a thorough explanation needed. Let’s knock out the easy materials first. Items such as buttons, scissors, felt, eyes, needles and any other item that is not yarn or hooks can be substituted to your desire. You may find something you like better or you may already have some of these items in your craft box. That’s great! Use whatever you have available or whatever you like best for the project you’re completing. Substitute within the same weight category. This means if the pattern calls for a worsted weight yarn, you should substitute with a worsted weight yarn. If the pattern calls for a bulky yarn, you guessed it, substitute with another bulky weight yarn. Doing so will ensure that the yarn you use is similar in size to the recommended yarn and you will have few (if any) gauge issues. There is definitely more to be said about this. Don’t worry, we’ll cover gauge more thoroughly in the next section. Keep the size difference as close as possible. I tend to work with metric sized hooks more often so you’ll hear me refer to a 5.5 mm or a 4 mm hook. If you’re working with metric hooks, keep the substitution no more than .5 mm higher or lower. Again, I give you this information with a big caveat. Deviating from the recommended hook size has the potential to change the gauge and sizing of the finished project. This ties in nicely with our next guide. Let’s say a certain crochet designer has a very tight stitch tension. She makes a cardigan pattern using a worsted weight yarn and a 5.5 mm crochet hook. Now, an eager crocheter with a loose stitch tension dives in to recreate her beautiful design. She gets the same yarn and the same hook and works up the cardigan. When she puts it on, it feels two sizes too big. What happened?! In its simplest form, gauge is a measurement of stitches and rows. This measurement is used to allow for differences in tension and crochet styles so we can replicate a pattern in the same size as someone else. Sounds easy enough, right? Sure, until it’s time to put it into practice! Many people are confused by gauge and ignore this section of the pattern altogether. In some situations you can get away with this. Gauge isn’t very important for items such as washcloths, scarves, bags and to some degree, afghans and baby blankets. Gauge is very important, however, to projects that will be worn as we saw in the example above. So why is this guide the most important piece of information? Because it tells you exactly what your stitches should measure in order to have your project come out the correct size. In the last section, I mentioned that a pattern has a recommended hook size. It is “recommended” because the hook size is subject to change based on how you crochet. Anytime you start a new pattern, you should always observe the gauge and make a test swatch. That means, eight stitches across equals two inches in length and four rows up equals two inches when worked in the single crochet stitch pattern. When you’re given a gauge like this, you should crochet up a little test square that is slightly bigger than what the gauge suggests. A few stitches and a couple rows larger will do. You’ll also want to start off using the recommended yarn and hook listed in your pattern. In our example here, I would crochet a square that is twelve to fifteen stitches wide and six rows high. Once you’ve made your swatch, you’ll need to get a small ruler or tape measure and compare the sizes of your stitches to the gauge listed in your pattern. If your gauge matches, great! You can proceed with the pattern and be confident that the sizing will come out as expected. If your gauge swatch measures smaller than the gauge in the pattern, you will need to crochet another test swatch (of the same size) using a larger crochet hook. If your gauge swatch measures larger than the gauge in the pattern, you will need to crochet another test swatch (of the same size) using a smaller crochet hook. After each attempt, measure and adjust as needed. Remember, a larger crochet hook corrects smaller gauge and a smaller crochet hook corrects larger gauge. Once you are close to the pattern gauge, pat yourself on the back! You’ve just made your first gauge swatch! Remember though, as you progress yourself from beginner to advanced level patterns, you’ll have the opportunity to practice this concept. The easier the pattern, the more straightforward this guide will be. The last piece of information from guide #4 is sizing. This will describe the size of the finished object and is very useful when planning projects! Have you ever looked at a pattern and thought, “what language is this in? !” Well friends, it’s crochet language! So what are we abbreviating exactly? Abbreviations are used for stitches and locations of stitches. They condense the pattern so it is easier to read and to some extent, more economical to print. Fortunately, crochet abbreviations are universal so once you learn them, you’re set! All good patterns will have an abbreviation section that includes every abbreviation that shows up in the pattern. Have a glance over this list before you start and you probably won’t even need to look at your abbreviations sheet. When I begin a pattern, I always go to the pattern notes section first because it gives me so much valuable information about the pattern. In the pattern notes you will find a ranging degree of information – it will often answer the question that may be on your mind. It will provide resources to techniques that may be unfamiliar with you. It will give you the instructions to execute specials stitches. There are many golden nuggets in the pattern notes section so definitely don’t overlook this one. As straightforward as it seems, my simple advice here is to read the pattern notes section. Now that we’ve covered all six guides that you will find in every pattern, do you find reading patterns a little less intimidating? It’s much easier to wrap our minds around a concept that follows a pattern (pun intended). Yes, all crochet patterns follow the same structure. Now that we have covered each element of the pattern framework, we are well on our way to understanding patterns! My challenge for you before we move forward is to find three crochet patterns. They can be in a magazine, book, online or from my website. It doesn’t matter because all patterns are built upon the same framework. Find three patterns and circle or identify each of the six guides. Read them. Familiarize yourself with them. Try to understand the information they are giving you. A true understanding comes from repetition and recognition. 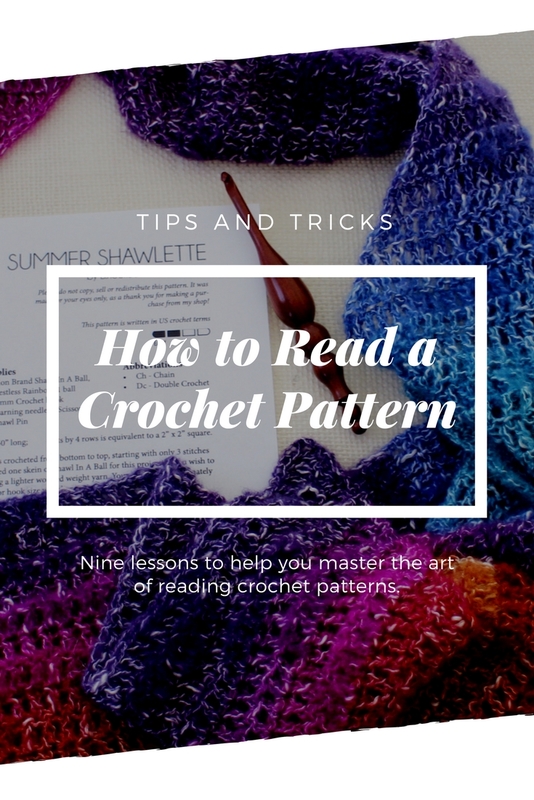 I know understanding how to read a crochet pattern is a real trouble spot for many of you and I’ve dedicated a series of blog posts and podcast episodes to help you with this struggle. I’m calling it the Master Crochet Patterns series and it’s crucial to your success. Understanding the information within this article is step number one. Are you ready for step two? Click or tap the button below to go to step number two of the Master Crochet Patterns Series. Excellent part one! You may want to say somewhere that this part applies to both written and graphed patterns.